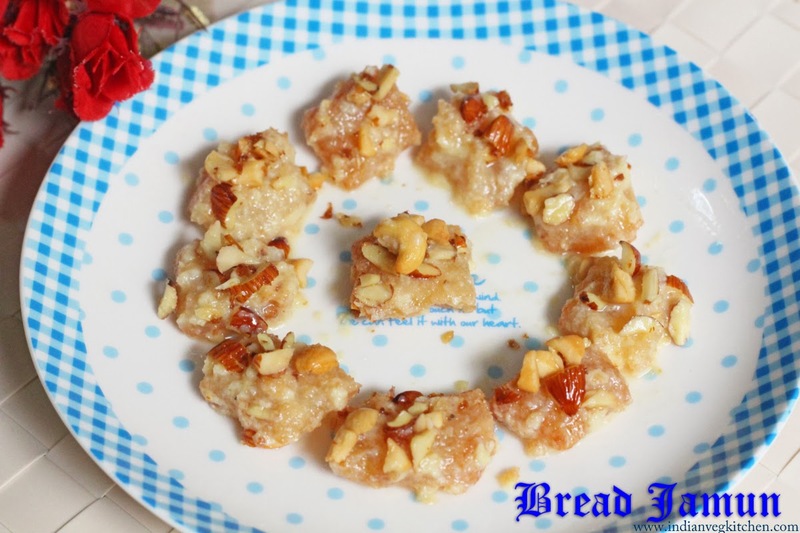 Bread Jamun is a very simple and quick dessert which can be made with left-over bread. 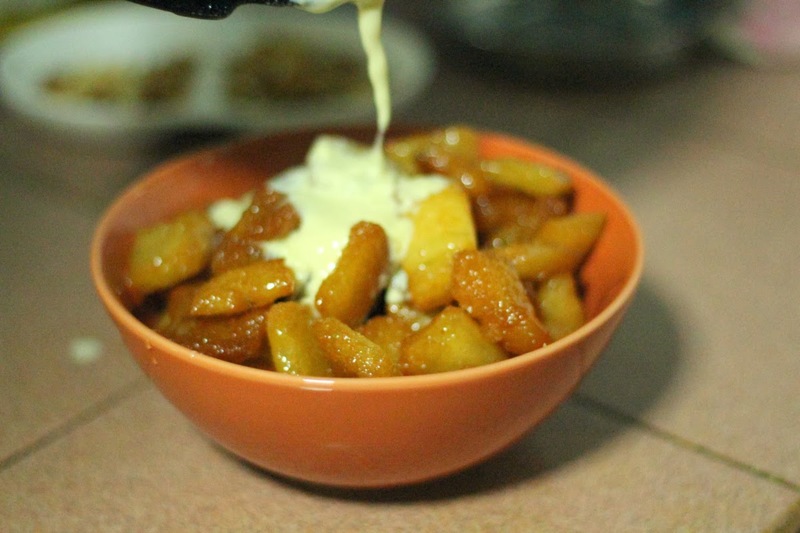 Recently, after having done with my Badusha preparation, I was left with the surplus sugar syrup as I normally prepare more than the required quantity of syrup for hassle-free soaking of the Badushas. I also have a saver-recipe to make best use of this extra syrup, which my amma used to do in minutes for a quick dessert to serve surprise guests. 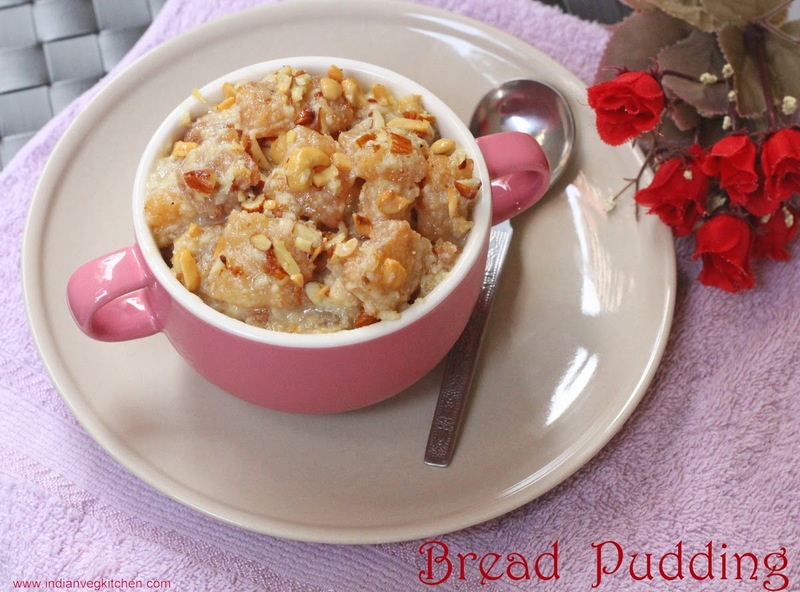 It is a rich, creamy and decadent dessert that is an Indian variation of the traditional English-style bread pudding. Do you have bread, oil, sugar and milk on hand? 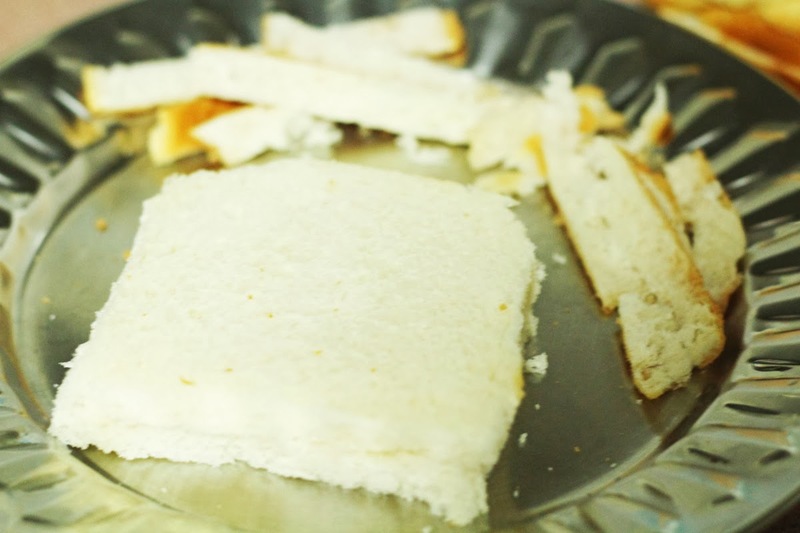 Then, why not whip up this Bread jamun for a surprise treat? 1. 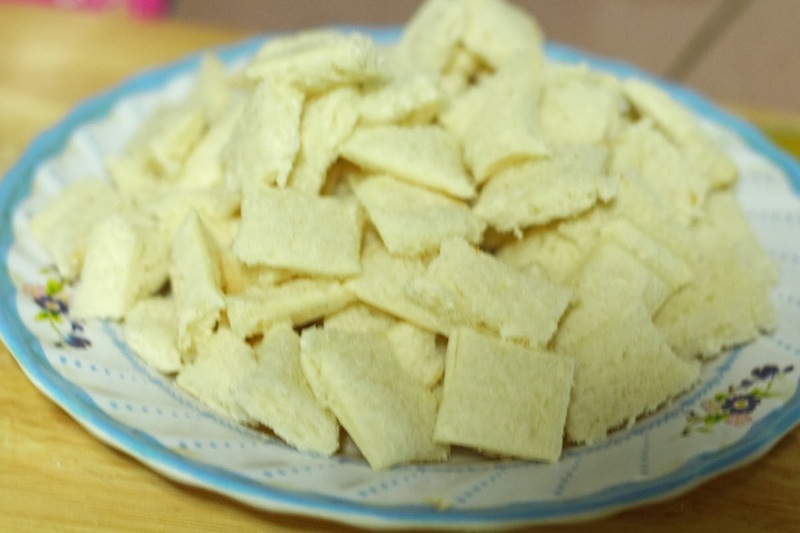 Remove the bread crusts cut into bit sized cubes. 2. 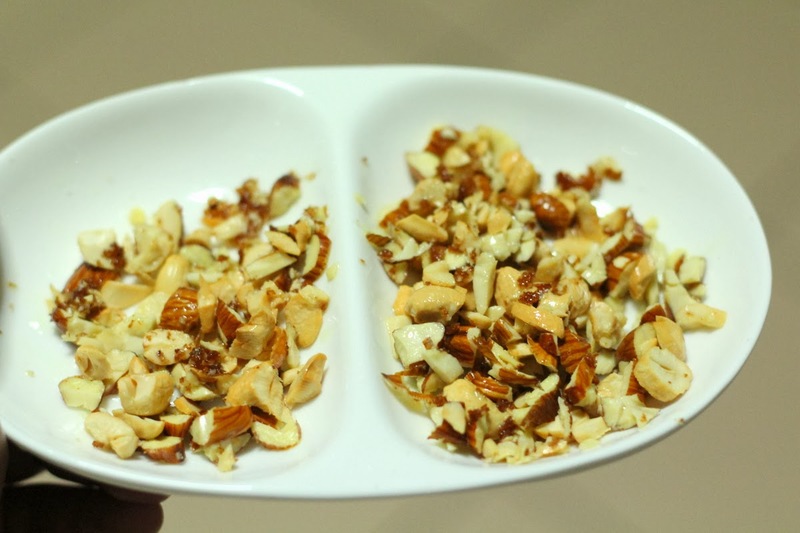 Roast the nuts in a teaspoon of oil / ghee and keep aside. 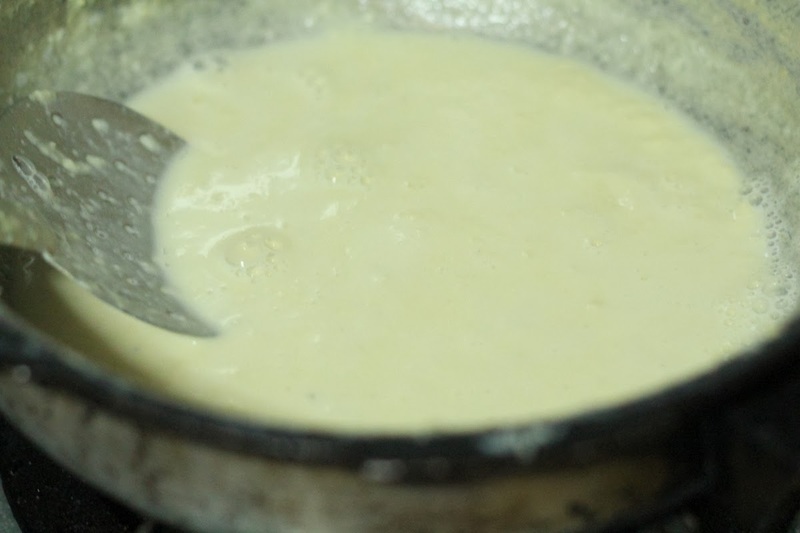 Bring milk to boil in a wide pan and simmer for 15- 20mins until it thickens to 3/4 cup. It will be of condensed milk consistency. 3. 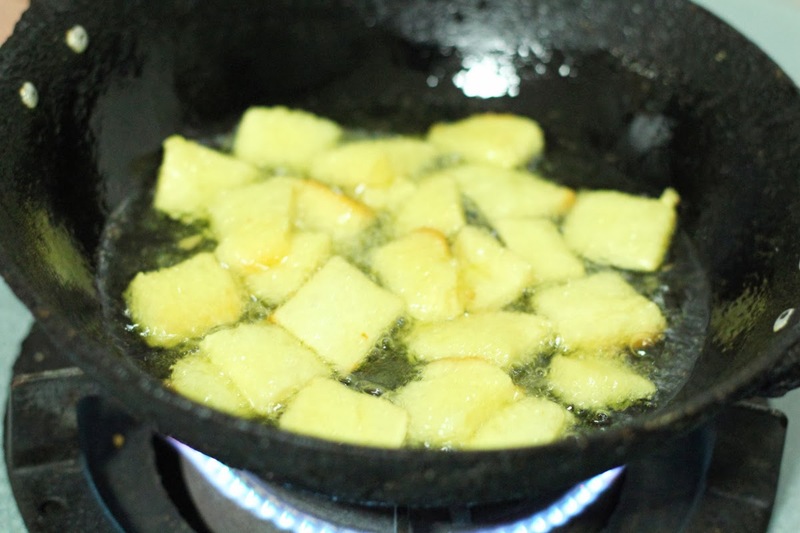 While is milk is getting done,fry the bread cubes in oil until golden brown and transfer to a kitchen towel. 4. Make a sugar syrup with 1/2 cup sugar and 1/2 cup water. Once it starts getting sticky, switch it off. Do not let it boil to a thicker consistency. 5. 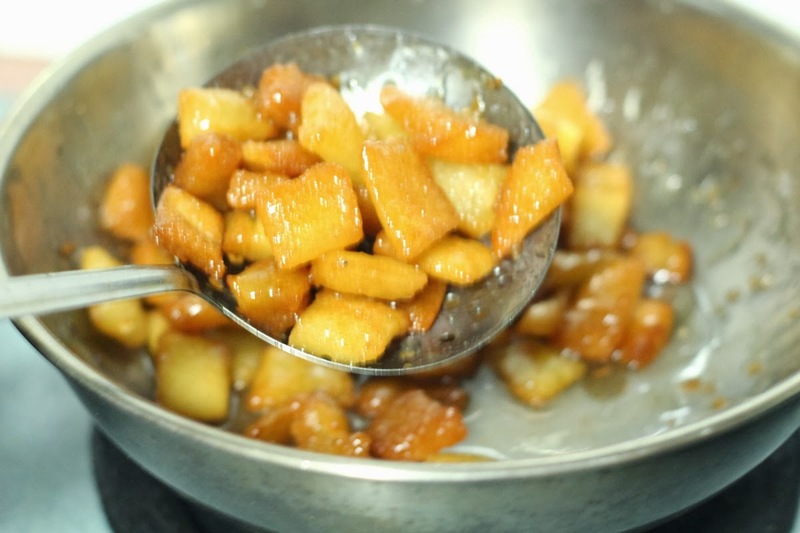 Soak the fried bread pieces in sugar syrup for 5 minutes and transfer to a wide bowl. Finally, pour the thickened milk over it and garnish with nuts. 6. Serve warm or cold with a dollop of whipped cream or vanilla ice-cream. If you have a sweet craving and looking for a sweet indulgence, then this recipe is your best bet. With the added richness of milk, these bread jamuns sure will get you addicted. Do try and let me know how you liked it. This sounds like another version of shahi tukra . I am sure it must be tasting heavenly . Drooling here, bread pudding tempts me a lot. Who can resist to this delightful dessert. Wow this is so different.On reading the name i thought you will make it like gulab jamun.. Lovely dessert with leftovers..
wow that is lip smacking bread pudding :) Loved how you named it bread jamun.. Wonderfully explained with your pictorials ..Looks so yummy , and love that cute pink bowl. 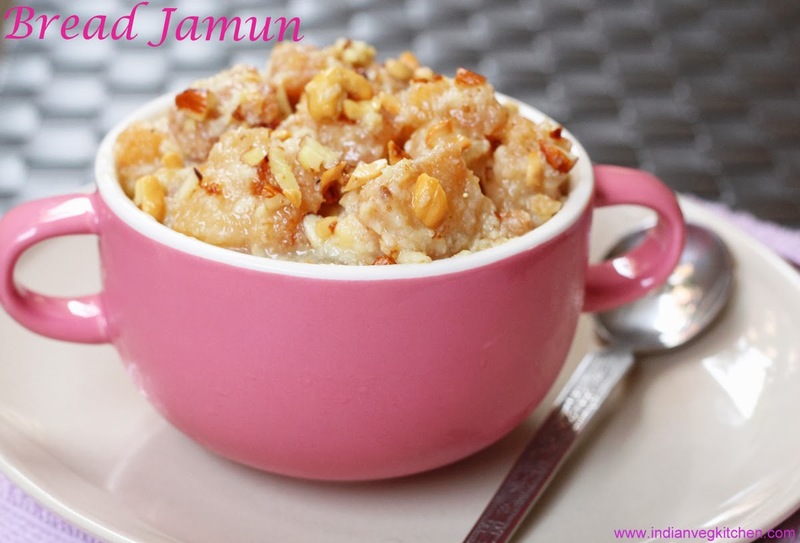 This is somewhat similar to double ka meetha or shahi tukda. Mouthwatering eggles bread pudding. Such a delicious pudding that is. Quite a quick one. It's great idea to put together the left over bread and the badusha syrup. Very rich dessert and nicely done. Omg that's a sinful bread pudding.Looks like another version of shahi tukda. Used to prepare it a long time ago. Delicious bread pudding. wow that is tempting!! Sinful bread pudding!!! I've tasted these at a friend's place and they are indeed a delight to dig into.